Will US sanctions scuttle a nuclear deal with Iran? Tyler Cullis and Trita Parsi outline the findings and ramifications of a new report from the National Iranian American Council (NAIC) on President Obama's legal authority to roll back sanctions against Iran as part of a comprehensive nuclear deal. The president, they argue, is constrained by the law in a way that dangerously limits his ability to deliver on the key transaction of nuclear talks: sanctions relief for nuclear concessions. It is clear that any final nuclear deal between Iran and the P5+1 will require deep and creative thinking on how to provide the US and its European partners confidence in the peaceful nature of Iran’s nuclear program, all the while respecting Iran’s nuclear rights. Understandably, lots of expert opinion has focused on forging a delicate balance between the parties and their respective interests in this regard. Less discussed, however, is what will need to happen in the US should that balance be found. This is troubling, especially in light of the fact that the White House might not have the power at present to meet its commitments if and when a nuclear deal is agreed to. As a recent NIAC report demonstrates, the President is deeply constrained in his ability to lift the robust energy and financial sanctions Congress has imposed on Iran. Under current law, the best the President can offer Iran are time-limited waivers that he promises to renew for as long as Iran keeps to its commitments under a nuclear deal and for as long as he remains in office. Whether succeeding Administrations would feel similarly bound to a nuclear deal that might well prove a political thunderbolt is unclear. If this is supposed to inspire the confidence required for Iran to agree to strong and sustained nuclear concessions, we’d do well to reconsider. Any deal that allows Congress to litigate and re-litigate the issue every six months (as would happen if waiver were used as the primary means of sanctions relief) is not one that Iran will feel comfortable hanging its hat on. Presumably, US negotiators have also communicated to the Iranians what is possible at present in terms of sanctions relief. But if so, therein lies the problem. If the US is offering limited and reversible sanctions relief to Iran’s negotiators, Iran might well reciprocate with similarly limited and reversible concessions on its nuclear program. This is especially likely to be the case as Iran’s negotiators came into the talks explicitly conditioning a nuclear deal on the dual principles of proportionality and reciprocity: limits to Iran’s nuclear program would be balanced out by what the US offered in return. In other words, the US could not ask for more while giving less. Moreover, by withholding from the President the ability to lift sanctions on a more permanent basis than available at present, we distort the logic that ostensibly informed sanctions advocates. Under this logic, Congress would impose sanctions on Iran so that if and when a nuclear deal was ever agreed to, lifting the sanctions would come with a cost to Iran. That cost would be measured out in the limits it placed on Iran’s nuclear program. But if the President is unable to relieve the sanctions on a permanent basis, this logic is defeated. It does not matter whether Iran is willing to concede important elements of its nuclear program. The White House is simply unable to match Iran’s concessions with sanctions relief of its own. In the give-and-take of negotiations, the US – it turns out -- has too little to offer. That is why it is critical that the White House and allies in Congress look closely at the current authorizations for the President to relieve the sanctions and consider what needs to take place if and when a nuclear deal is reached. It is entirely possible that Iran and the P5+1 reach agreement in the next several months. If so, the White House must be prepared to meet its commitments under a nuclear deal and, in so doing, ensure that Iran does the same. It would be a terrible irony if the sanctions – which its advocates contend are responsible for the seriousness of Iran’s present engagement – acted as a final bar to a secure and stable nuclear agreement with Iran. Tyler Cullis is a Policy Associate at the National Iranian American Council (NIAC). Trita Parsi is the co-founder and President of NIAC. Post #441 - What Are They Thinking in Tehran? Last November 24, the world breathed a sigh of relief. In the course of an impassioned night in Geneva, Iran and the countries of the Group 5+1 (the United States, Russia, China, France, Great Britain and Germany) reached an agreement on Tehran's nuclear program. Iran has committed itself to limit the enrichment of uranium within 5% and authorized the International Atomic Energy Agency (IAEA) to inspect its nuclear sites. In return, it received the assurance of the suspension of the sanctions for six months. The facts have proven them wrong, demonstrating that dialogue can also smooth out crises that are apparently irresolvable and bring diﬀerent cultures closer. The solid diplomatic relations that exist proﬁtably between the Holy See and the Islamic Republic of Iran constitute a valid example in this sense, sublimated by the fact that the accredited Iranian diplomatic personnel beyond the Tiber is the second largest in terms of size. ZENIT met in an exclusive interview with Ambassador Mohammad Taher Rabbani, who presented his Credential Letters last June. In the following interview we spoke with him about the Geneva Agreement and inter-religious dialogue. ZENIT: Your President, Hassan Rohani, said that “threats cannot bring any fruit,” and he signed an historic agreement on the nuclear program. What can you tell us regarding this? Can you explain to us what it is about? Ambassador Rabbani: In the name of the clement and merciful God, I thank you for having come to us as a guest in this Christmas period. My wish is that next year will be a year of peace for the whole world. As you know, Iran is one of the signatories of the Nuclear Non-Proliferation Treaty; consequently, it is a right of hers to make a peaceful use of nuclear energy. Moreover, this Treaty puts no limit on the peaceful use of nuclear energy as written expressly in Article 4. Therefore, Iran is acting on the basis of the rules of the International Atomic Energy Agency and – I add – on the basis of our religious teachings, which reject the use of nuclear arms. In this connection, it is useful to recall that, in 2012 our Supreme Leader, Ayatollah Ali Khamenei issued a fatwa that prohibits the production, stocking and use of nuclear arms. This right was conﬁrmed in the recent Geneva Agreement. Therefore, after ten years of meetings, the six world powers of the Group 5+1 have accepted and signed Iran’s right to continue to enrich uranium up to 5% in its territory. From a political point of view, this Agreement is of enormous importance for Iran, because ﬁnally it made the logic of dialogue for peace prevail over the logic of violence and military intervention. This Agreement, then, provides for some of the banking sanctions to be suppressed, the diﬃculties regarding the insurance of oil vessels and the transfer of money from the sale of oil. Iran is committed for six months to suspend the activity of enrichment of uranium; our hope is that the West will make use of this period to give trust to Iran and renew relations. What happened in Geneva has demonstrated that agreements are established on the basis of mutual respect and not on the basis of sanctions. ZENIT: What damages have the sanctions imposed on your country caused the population? To what degree do you foresee that they will be reduced at the end of six months of suspension of nuclear activity? Ambassador Rabbani: I must say ﬁrst of all that these iniquitous embargoes, if on one hand they have damaged us, on the other they oﬀered us advantages. First among all was the reinforcement of the bond between the Government and the Iranian people. The great Iranian people responded forcefully to these illicit sanctions, even if they suﬀered enormous damages. I give an example that the West, which calls itself a defender of human rights, must always impede: some persons aﬀected by grave illnesses are in need of receiving particular medicines that, however, because of the embargo, they could not receive. The great Iranian people has always been beaten, however, to aﬃrm their right, there are the testimonies of many young scholars who were killed by mercenaries of enemy regimes. Episodes that did not discourage the Iranians, and this was seen during the last presidential elections, which saw the participation of the great majority of voters. My expectation is that in future we will be able to come to a deﬁnitive agreement. These six months represent the right occasion to ﬁnally resolve the nuclear question. With the stipulation of the ﬁnal and global agreement after the aforesaid six months, all the sanctions imposed by the United Nations Organization and the unilateral ones imposed by America and by the West will be eliminated. ZENIT: In what way could the Holy See and Pope Francis help this peace process? Ambassador Rabbani: Either the Holy See, as a religious institution that guides the Catholic Church, or His Holiness, Pope Francis, can propose a diplomacy geared to attaining peace. Justice, peace and development in the addresses of Pope Francis and in those of Ayatollah Khamenei illuminate our life to reach a collaboration that I would describe as multilateral religious diplomacy. On the other hand, during an address regarding true diplomacy in the teachings of the monotheist religions, Archbishop Pietro Parolin, Vatican Secretary of State, described diplomacy as “the art of hope.” In my opinion, this vision must be promoted in the world, because today we are living a critical situation which can only be resolved by a diplomacy that gives hope. This type of diplomacy also belongs to the political program of President Rohani. ZENIT: What is the situation of Christians in the Islamic Republic of Iran? What rights are recognized to them and, beyond the juridical aspect, what is their relation with the Muslim population? Ambassador Rabbani: In Iran, peaceful coexistence between Muslims and Christians is an example for the whole of the Middle East. Testimony of this also is the ancient relation with the Holy See, which goes back to the 13th century and which was realized in the constant political and diplomatic encounters with Congregations such as the Carmelites and the Dominicans. It is part of the teachings of our religion, on the other hand, to maintain friendly relations with the three religions of the Book. This tradition of hospitality is present in the Constitution of the Islamic Republic of Iran, which defends the rights of religions of the Book and guarantees them representatives in the Parliament. In ﬁne, President Rohani’s program reinforces this political line. ZENIT: Every two years there are bilateral meetings between the Islamic Republic of Iran and the Holy See to foster inter-religious dialogue. There was a meeting recently between the Iranian President Hassan Rohani and Archbishop Leo Boccardi, new Apostolic Nuncio in Iran. What common objectives were established? Ambassador Rabbani: Underscored during that meeting was the fact that today, more than ever, the dialogue between Islam and Christianity is important. Shiites and Catholics must know one another better, in order to identify points they have in common. Because many misunderstanding are born in fact from reciprocal ignorance. Terrorism and extremism are our common enemies. However, it is our common objective, instead, to make a contribution to peace and to combat poverty, beyond the religious confession and nationality of the poor. ZENIT: In your opinion, what other misunderstanding are there which sometimes impede a peaceful relationship between the Muslim world and the Christian world? Ambassador Rabbani: We believe that all the prophets had the same objective. Therefore, if all the prophets were to live together there would be no problem among them. In the last years there has been no clash between Islam and Christianity. The oppositions we witness in some regions of the planet are of an ethnic character more than religious. Sometimes, in fact, there are conﬂicts between persons of the same religion. However, unfortunately there are some obstacles. The main one is due to the prejudices that a great number of believers have in opposing followers of the other religions, by way of mistaken behavior toward the other on the part of some Muslim and Christian rulers in the course of history. These negative events have a religious covering only in appearance, but they have equally caused disputes between some believers of these two religions. I, as diplomat and religious, am convinced, however, that religious heads at the world level can have an important role in attaining peace as opposed to discriminations and apartheid. A recent example in this connection comes to us from Nelson Mandela who, although he was not a religious ﬁgure, had an important role for peace in South Africa. In ﬁne, I recall that all the monotheistic religions invite peoples to believe and practice the mercy of God in society. ZENIT: What, instead, are the challenges that Islam and Christianity can address today side by side? Ambassador Rabbani: We could draw up a long list. However, the most important challenge is the dialogue to promote a culture of peace that can oppose war. In the absence of dialogue, however, there cannot be any sustainable and deﬁnitive development. Violence and extremism are wounds that must be healed as soon as possible. The religious heads of Islam and Christianity can work together for this objective. For instance, the appeals of Pope Francis (for whom we have great respect) to pray for peace, as well as the role he had to prevent the military attack in Syria and reinforce a coalition of peace in the world, together with the appeal for world peace of Iranian President Rohani during the 68th UN General Assembly , in my opinion can create a front for peace to oppose the front that wants war. This collaboration, if it continues with common programs, involving many religious heads active in the ﬁeld of global peace and justice, can build a global front of the great religions for peace. My proposal is that it be the Holy See and the Islamic Republic of Iran that build this front. The occasion to take an important step in this direction could be the ninth inter-religious meeting between these two States, which will take place in Teheran in 2014. Moreover, Iran can use her political potential in regard to the guidance of the Movement of non-aligned countries -- made up in greater part by Christian Catholic countries and Muslims – to create a Forum within it that welcomes the constructive collaboration of the Holy See. Four members of The Elders will travel to Tehran on Sunday 26 January for a series of private meetings with the Iranian leadership. It will be The Elders’ first visit to Iran as a group. Brought together by Nelson Mandela in 2007, the Elders are twelve independent global leaders who use their collective influence and experience to promote peace, justice and human rights worldwide. The purpose of the three-day visit is to encourage and advance the new spirit of openness and dialogue between Iran and the international community, and to explore what could be done to enhance cooperation on regional issues. 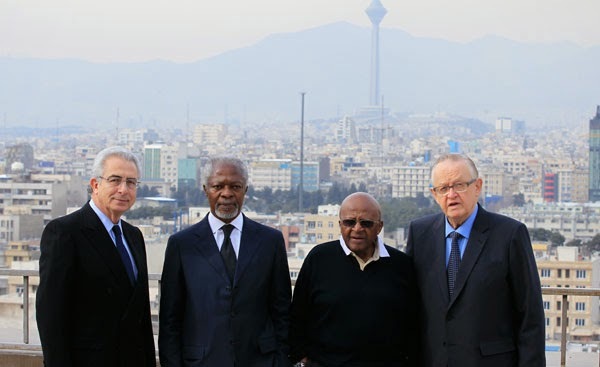 The Elders see the recent positive developments as a historic and strategic opportunity to end decades of animosity between Iran and the international community and to rebuild relations on the basis of trust and mutual respect. They recognise, however, that trust will only be built slowly, through continued goodwill and reciprocal action. The Elders will exchange ideas with the Iranian leadership about peaceful ways of addressing conflict and healing sectarian divisions in the region. Post #438 - Let's Go! Last week we partnered with MoveOn.org, Credo, Peace Action West, Just Foreign Policy and Win Without War to deliver over 100,000 signatures to the US mission in the UN. Check out the photos. Here's us handing over your signatures. MoveOn.org petition has more than 147,000 signatures calling on Congress not to undermine President Obama's diplomatic negotiations with Iran. Lots of MoveOn.org members have taken action in this effort, and we thought you'd be interested in her [Sara Haghdoosti's] update on this important campaign. A few weeks ago, we were looking at the prospect of Senator Menendez's sanctions bill getting a veto-proof majority in the Senate and torpedoing the president's negotiations with Iran. In other words, we made this happen. Over the past few weeks since this legislation was announced, over 150,000 people have taken action, we've made over 10,000 phone calls, and we've had petition deliveries all across the country. What we're doing is working, and that's exactly why we can't let up now. What we've achieved over the past few weeks is proof that not only can we fight back against war, we can help create the space for politicians to become champions for diplomacy. Now is the time for us to turn supporters into champions and the undecided into supporters. That's why over the next few weeks I'll be in touch about things you can do in your local area. Today, I just wanted to say "Congratulations!" I've never seen a political turnaround like this. We may not have money or fancy lobbyists, but what we do have is each other. The power we have when we stand alongside each other is truly inspiring. Post #437 - Who is Threatening Whom? The US Peace Council joins you in opposing S. 1881, the “Nuclear Weapon Free Iran Act.” S-1881 sabotages the diplomatic progress of the “Joint Plan of Action,” expands sanctions that are causing suffering for the Iranian people, prohibits Iran from pursuing peaceful nuclear processes necessary for energy production, and offers US military support to Israel to attack Iran—subordinating U.S. national interests to the military maneuverings of Israel. S-1881 is a move toward war! The Iran nuclear issue is a ruse. There are, in fact, two nuclear-armed states threatening the Middle East—the United States and Israel. The United States maintains 18 ballistic missile submarines—an undisclosed number of which are positioned with the U.S. Fifth Fleet in the Persian Gulf—carrying a combined total of up to 398 missiles, each missile armed with multiple nuclear warheads. Israel possesses three nuclear-capable submarines, and a nuclear arsenal estimated at up to 200 warheads. The real threat of a nuclear launch is from the United States and Israel! We must act now to prevent another war in the Middle East by demanding a Nuclear Weapons and Weapons of Mass Destruction-Free Zone (NWMDFZ) in the Middle East, a solution that would eliminate all nuclear weapons from the region, including those of the U.S and Israel. The United Nations 2010 Review Conference of the Nuclear Non-Proliferation Treaty mandated a conference in Helsinki at the end of 2012 to create this NWMDFZ, but it was derailed by the United States and Israel at the eleventh hour. We must demand that the Helsinki conference be called and the NWMDFZ in the Middle East be implemented.